Fr. Pradeep Shail, S. J.
Fr. 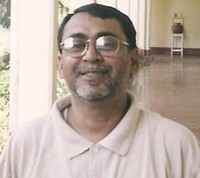 Pradeep Shail, former Principal of St. Xavier's (1998-2008), passed away on Oct 19th at approximately 8 pm. Fr. Pradeep’s father was in the State Forestry service. Pradeep was born in Chaibasa and moved from school to school as his father was transferred about the State of Bihar. His education included a short time in Carmel Schools in Hazaribag and Madhupur, St. Xavier’s Patna and other schools. He finished his secondary schooling in St John’s High School, Ranchi, and later I. Sc. and B.A. Hons. in English in St Xavier’s College, Ranchi, and finally M.A. English from Ranchi University. He joined the Society of Jesus in August 1980. His noviciate was at Lupungutu, Chaibasa, Juniorate at St. Stanislaus College Sitagarha and Pholosphical studies in Satya Nilayam, Chennai. He served at St. Robert’s High School, Hazaribag and Vivek Sadan, Daltonganj as regent. After one year of theological studies at the Regional Theology Centre, Ranchi, he moved to Vidya Jyoti College, Delhi where he completed his Bachelor of Theology in 1991. He was ordained priest in November that year. Fr. Pradeep Shail joined St Xavier’s, Hazaribag, as a teacher in May 1993 after serving for a year at St. Xavier’s School, Bokaro Steel City. He was appointed Principal in 1998. With this educational background coupled with a friendly, outgoing nature, as school Principal Fr. Pradeep mixed freely in Hazaribag society bringing the school to a wide circle of citizens. Under his patronage HOXA flourished. In the millennium year of 2000 he was sent for eight months to Australia and was enriched by his experience of Australian Jesuit life and was able to see some Jesuit schools in Australia, the prototypes of the early St Xavier’s. Fr. Pradeep was given a few months’ break from March 2008. In October that year he was appointed Headmaster, Masi Marsal School, Charhi. In April 2010 he became Principal of St. Xavier’s School, Bokaro Steel City. From there he was transferred to St. Xavier’s Hindi Medium High School, Sitagarha in June 2016. He was also the Superior of the Jesuit Community at Primary Teachers’ Education College, Sitagarha. Recently he had a typhoid infection. For the last several years he had struggled to keep his blood glucose level under control. On Oct 19, around 6:00 pm he complained of severe breathing difficulty. He was brought to Arogyam Hospital in Hazaribag town about 6:45 pm. By then his condition had become critical. The tests revealed that he had suffered a massive heart attack a few hours earlier. All attempts to stabilise his condition failed and the doctors declared him dead at about 8:30 pm. The funeral is likely to take place at 1:00 pm on Sunday in the Jesuit Cemetery at St. Stanislaus College, Sitagarha. Info provided by Fr. PJ James, ex Principal. RIP Fr.Pradeep Shail. I did not know you personally and never got to meet you. Your elder brother Dr.Ranjit Shail is a good friend of mine.He pays me a visit whenever he comes down to Kerala, as his wife is also from Kerala.I got to know about you from him.Yesterday he paid me a visit and I could offer him by heartfelt condolences. Difficult to believe he is no more. I was lucky to have been working under him for three years. Heartfelt condolences to Hazaribag Jesuits and his family members. May his soul rest in peace!